Have you known that a blockchain platform that has VIP participant program? This is about it. UTEMIS is a company created by professional and successful managers. Professional organizations value and take good care of long term stakeholders. As such, and as a way to reward early token participants, all participants that donate in the UTEMIS Token issuance will automatically become UTS VIP Participants at UTEMIS and will retain the rights associated with the number of tokens purchased. The UTS VIP Participants Program is only available to those participating in the ICO and only for the tokens acquired during the ICO. If a VIP Participant sells part of his holdings after the ICO, he will only retain the rights associated with the tokens remaining in his ownership. For the instance, if a participant buys 25 million UTEMIS in the ICO and after the token distribution event that participant sells 15 million UTEMIS, he will retain only the VIP Participant rights associated with the 10 million UTEMIS kept. Once a participant has sold all the initial UTS holdings this participant will no longer be able to participate in the VIP Participants program, regardless of the purchases made after the token distribution event. The UTEMIS VIP Participants program are eligible to receive several rewards, including free token distributions and additional benefits in the event that UTEMIS Limited Liability Corporation makes an IPO (Initial Public Offering in the Stock Market) or is acquired. UTEMIS has scheduled to reward to all VIP Participants a portion of the equivalent number of tokens that they retained after the initial token distribution event. People that purchase UTEMIS after the initial token distribution event are not eligible for participating neither in the UTS VIP Participants Program nor in the UTEMIS Yearly Reward. The UTEMIS Business Model is well known and very successful in other geographies – particularly in China with the Chinese e-commerce giants. There is some likelihood of UTEMIS attracting the interest of external investors or potential acquirers during the first years of operations. In fact, some UTEMIS founders have worked with these Chinese e-commerce giants the extensively and are in contact with some of these companies regularly. Only UTS VIP Participants are eligible for the rewards program associated with an Initial Public Offering in the Stock Market or an acquisition of the UTEMIS Limited Liability Corporation. People that purchase UTEMIS after the initial token distribution event are not eligible for participating either in the VIP Participants Program or in the UTEMIS reward program. The event of an IPO, an Initial Public Offering in the Stock Market, or an acquisition, UTEMIS would like to show gratitude to the early participants that participated in the initial token distribution event. 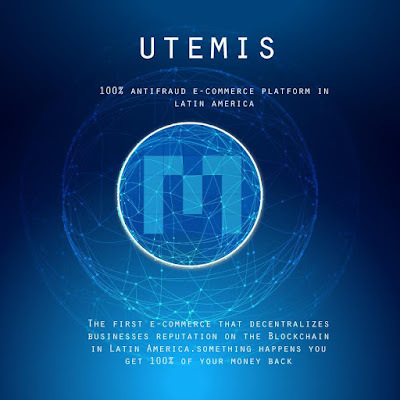 If any of these events would materialize, UTEMIS will take into consideration these participants and might consider including some kind of benefit for them in the transaction, as long as the terms of the transaction allow. In no circumstance these benefits might be interpreted as the equivalent of investors cashing out, dividends, stock buybacks, or any other equivalent right that a shareholder has a right to exercise over a company. The UTEMIS VIP Participants Program and the UTEMIS reward policy are eligible, temporary, and were designed exclusively as a way to thank stakeholders (not shareholders) for participating in the UTEMIS initial token distribution event. What sort of projected value and growth should you expect is probably the next question, I wouldn’t be surprised if by the end of 2018 Utemis was trading over $200m annually and growing from there. An important part of this is down to the fact once some businesses are successful others want to be part of it and eventually it grows itself organically. In the same way that Alibaba put a lot of work in on the ground to get businesses to work with them and once they seen the benefits not only did they want to use it more. Their competitors then join to avoid being left behind, at the same time those who the scam, steal or any other dubious methods will fall by the way side because of the reputation system. They will either have to become honest business people or find a new business. The token values are cheap and although the aim is to get around $50m investment its mainly around getting that initial boots on the ground to bring in the customers to get the business circulating. From the get go it’s about getting marketed and people moving onto the platform to buy and sell goods. Which is another important point this is an ICO that is going to be up and running within notime which means the value of the tokens will increase in a very short period of time. Your not talking about an ICO that doesn’t have a solid team. Its a group of professional business people that are used to managing large businesses. Its also a proven business model and with people that know how to implement it and have access to the right people and resources. Then there is the possibility of a complete buy out before the ICO even gets through the ICO period as companies are aware that once it gets through the ICO period and starts delivering its value will be like Alibaba.com to the point it will become too big and too expensive to buy if given enough time to grow. With an early buy out as a token holder you will become part of that deal and share in the profit of the sale if happens.